399 people in our community are currently praying with you. Then Abraham said to his young men, "Stay here with the donkey; I and the boy will go over there and worship and come again to you." And Abraham took the wood of the burnt offering and laid it on Isaac his son. And he took in his hand the fire and the knife. So they went both of them together. And Isaac said to his father Abraham, "My father!" And he said, "Here I am, my son." He said, "There are the fire and the wood, but where is the lamb for a burnt offering?" Abraham said, "God will provide for himself the lamb for a burnt offering, my son." So they went both of them together. Yesterday, we talked about the need for burnt offerings. God's law, stated in the Old Testament (right in the same books as the Ten Commandments), requires them. Why, then, do we no longer make them? Christ did not abolish the law; and yet, I doubt many of us have burned an animal carcass or measure of wheat on a fire, as God commands, or even overcooked a hamburger on our grill as a sacrifice to the Lord. Why not? Our duty to do so is right there in the Bible. Today's passage provides the answer. Abraham still believes that God has required him to kill his son, Isaac, and burn his body as a sacrifice to Him. So he does not fully understand the prophetic truth of his words: "God will provide for himself the lamb for a burnt offering". This is the first prophecy of Christ in the Bible. As unwitting as it is, the remark is profound. We often call Christ "the lamb of God", or even "lamb of God, who takes away the sins of the world", without fully appreciating its meaning. Burnt offerings were made as a sacrifice for sin. Technically, our duty to make this sacrifice still exists. But we no longer do it, because God Himself has provided the lamb for the sacrifice. Christ was the "lamb of God"; our duty to sacrifice, as detailed throughout the Old Testament, was satisfied by Christ's suffering and death. 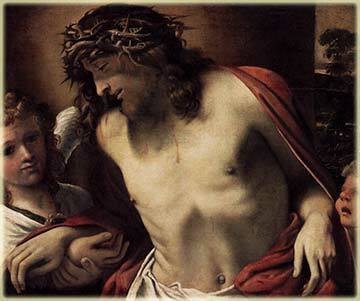 He gave His own body as a perfect sacrifice, sufficient for all time for those who would believe in Him. It is important to understand this. It is like there is a mortgage on our house, but someone pays the bill every month. It is easy to forget the debt exists and to think that we are debt-free, but this is wrong. Like the person whose mortgage is paid by someone else, we are not debt-free. Our constant sin creates a debt, and the requirement of sacrifice to atone for our sins still exists. The only reason we do not make these sacrifices is that someone who loves us, utterly and completely, has paid the debt for us in advance. Matthew 6:31-34: Therefore take no thought, saying, What shall we eat? or, What shall we drink? or, How shall we be clothed? For your heavenly Father knows that you have need of all these things.